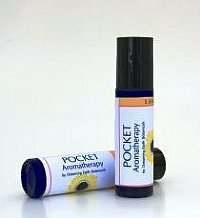 Our Chakra Essential Oil blends now come in portable roll-on bottles for ease of use. These chakra oil blends are diluted in our massage base of Grapeseed, Jojoba and Sweet Almond oils and come ready to use in our beautiful cobalt blue roll-on bottles. Available as a single or as a complete set of seven. Each blend is made of pure essential oils diluted in our carrier base and come in 10ml roll on bottles, ready to apply. To use, simply apply the blends to their corresponding chakra points (see below). Each roll-on holds 10ml of Chakra Oil blend. 7th or Crown Chakra: the top of the head. 6th or Third Eye Chakra: center of the forehead above the eyes (caution: do not get oil in the eyes!) You can also apply the blend to the back of the head. 5th or Throat Chakra: the base of the throat. You may also apply on the back of the neck. 2nd or Sacral Chakra Blend: the pubic bone and/or lower back. 1st or Root Chakra Blend: the base of the spine.